I disagree, for camera profiles my experience has shown pleasant colors and accuracy can go together when sacrificing total accuracy, by targeting a range of important subject colors like caucasian skin tones(max 1 DE in this case). Color error models likely do a good job of predicting percetibilty of color shifts, but dont account for color shifts in skin tones looking more objectionable for human subjects when treated equally to non-skin tones. Yes, for memory colors, especially skin, being off 3 dE can produce worse results than being off 15 dE in, say, foliage. If you look at the color shifts that output referred processing (normal photog) does you often get very large saturation increases in the greens while skin colors are kept pretty tight as people tend to like the look. The skin tone is what is mostly messed up in Adobe profiles and more often than not in native camera processing, being too red. Basically, you either have the right skin tone hue and natural reds and warmer greens and washed out blueish aquamarines\cyans, or good cyans and cooler greens but red skin tone and cyanish washed out blues and chemical bright reds. I am talking matrix here, do not see much sense in LUTs. My point exactly! Thanks for putting it so much more eloquently. 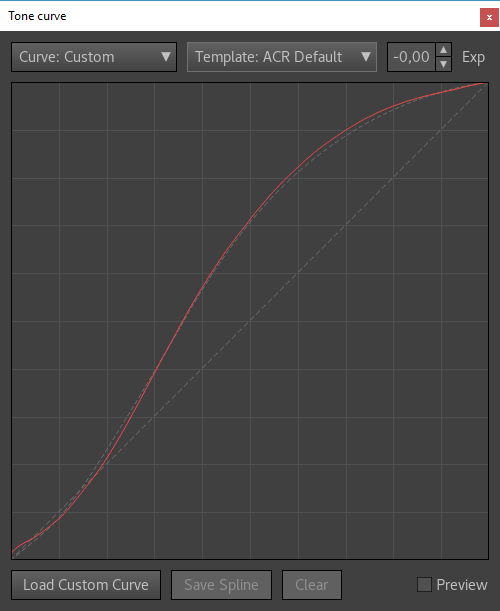 I have the same feelings toward the Adobe Standard colors as some of my exes...Aside from that they provide a valuable resource for tone curves in the Camera profiles which can be conveniently loaded into Lumariver PD. Among them I found a Canon EOS 450D curve that works well for a large range of subjects with fairly minimal tweaking. Coming back to color accuracy vs. subjective taste, Anders has done a lot of R&D on creating general-purpose profiles. I don't want to write-off his efforts just because I couldn't get it to work for my camera, which admittedly has a rather low DxOmark metamerism score. Hopefully my findings can aid future development. They happened to include the Canon 600D that I own and you can download the RAWs. Could this be useful for a improving a general purpose profile creation with current DCP spec? I was wondering if it was possible to use the Dcam Target+ from Basiccolor in Lumariver Profile Designer? Thanks for your answer, actually i think i have to modify a little bit the reference file as i got this message (image atached), to you know how to do it? the file you got is a simple text file so all you need to do is pull it into Notepad or whatever and add that keyword and the correct value. Whats the correct value? I'm not sure because I've never seen a dcam target but if you look at others, say the qp203, the right value is 7 whereas the correct value for a basic ColorChecker is 4. That tells me that (if you look at those two charts), it's the 'number of rows of patches'. Basically, Lumariver is telling you that it cant figure out the patch grid setup of the file (x rows by y columns). It's a minor patch release, that is mostly bug fixes and a few small improvements. I don't have as much time to be active on the forum for the moment. I'm very grateful for the help provided by users, thanks for that. And there's always the support email if you get stuck. There's just no reason for target manufacturers to make up own non-grid layouts, unless they have a reason to make the target hard to use in third-party software. that was the same thing I thought when I found a picture/advertisement for the Dcam and the number of patches didn't jive w/ the ref file. Did they leave out the entire border? Can one simply cut/paste the same values as existing B/W/G patches? Didn't look in detail, they did not leave out the entire border though. As long as there is one white, gray and black you can easily manually copy/paste, although it's a bit tedious. Another method is to strip away the border completely and just keep the center grid, but then you lose the flatfield feature that the border provides (and I'm not sure if white/gray/black is represented in some other patches than in the border, you need at least one white. You can do without black and grey, but they are nice to have, not the least to diagnose glare. A bright black means glare, and/or uneven light). Also, out of curiosity, I wonder what the average curve would look like. Bought Lumariver 2 weeks ago. It took a few tries but I finally got it right. I am very happy with the results. The bottom line is that I now have camera profiles that serve as nice accurate baselines from which I can evolve my images as I see fit. I found the documentation to be both thorough and very helpful. I originally bought basic, but after seeing how well it works, I am buying the repro version so that I can use multiple targets and create icc profiles for capture one. I kept the settings in Lumariver neutral, including not applying a "look". I also turned off "Adobe Black Subtraction" to avoid crushing shadow detail. BTW, I use Fuji. Although it doesn't seem to make a difference, I made one profile based on a DNG from Adobe DNG converter, and another profile based on a DNG from Iridient Developer. It was the same raw image for both. I used the Colorchecker classic in a very tightly controlled shooting environment. Wondering if anyone else has tried this since my last post. I have a question I am wondering if anyone can answer. I have a film scan of a Color Checker SG that I measure the patches of in 3DLUT Creator and then use that data with a Babel Color Patch Tool reference file to create a DNG Profile of in Lumariver Profile Designer. When I render the profile, the patched definitely change to close to the reference patches...especially the hue, but almost all of them are quite a bit more saturated and either lighter or darker than the reference patches. I have everything in the Profile Designer set to default and have tried utilizing almost all of the tools and options available, but that only makes things less accurate/pleasing. My main question is, how do I get the rendered profile patches to match the reference file patches? Realized I never tried a Reproduction Profile, so I've been trying that, but the software can't get past 81%...anyone else having this issue?